MATTHEWS Safety Products has released the latest in its range of New Pig safety products. The new products include universal spill kits for oils, coolants, solvents and water; HAZMAT kits for acids, caustics and unknown liquids; plus oil-only kits that absorb oil while repelling water. New Pig product manager Ben Nichol says the locally assembled kits have no loose absorbents (all absorbents are contained), with no consequent need for brooms or shovels. "No loose absorbents means clean-up is neither dusty nor messy; it's also not labour-intensive to clean up the absorbent that's cleaning up the spill. "Kits are intelligently constructed, to deploy products as they are required for emergency spill response," he says. 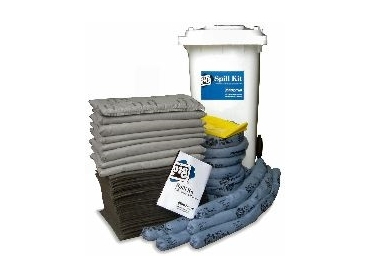 "Kits also have additional mats on top for small incidental spills, so someone responding to a spill - emergency or not - doesn't need to empty the whole kit or reach to the bottom to find products for absorbing small spills." Other benefits the kits feature include: tamper-proof seals for easy auditing, easily visible white containers and both colour-coded labels and product for fast identification - essential for quick emergency response. All kits come with training and a usage manual. * Universal Kit: can be used to absorb oils, coolants, solvents and water. The extra durable Matthews U240 Spill Kit absorbs up to 213 litres and can be used indoors or out, while the Matthews U120 Spill Kit absorbs up to 101L. Both sizes contains socks (two sizes), mats, pillows, tamper-proof labels, temporary disposal bags and an instruction manual. * HAZMAT Kit: is used to absorb acids, caustics and unknown liquids. The Matthews H240 Spill Kit absorbs up to 214 litres, while the Matthews H120 Spill Kit absorbs up to 103L. Both sizes contains pillows, socks, mats, tamper-proof labels, temporary disposal bags and an instruction manual. * Oil-Only Kit: the Matthews O240 Spill Kit absorbs up to 198 litres, while the Matthews O120 Spill Kit absorbs up to 104L. Both are extra durable, so can be used in or outdoors. They contain socks, mats, pillows, tamper-proof labels, temporary disposal bags and an instruction manual. Matthews also offers refill products for each kit.